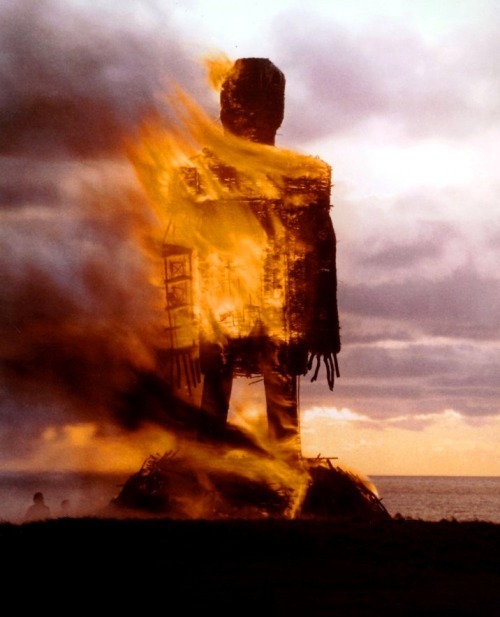 Tradition Through Folk Aesthetics in the Music of The Wicker Man (1973). The first case study film for this essay is Robin Hardy’s 1973 film, The Wicker Man. Though it is the latest of the films to be looked at, it has the most complex relationship with its music, formed entirely of its own accord rather than on folk horror practices formed before it. This musical score has many links to the Folk Horror Chain, tying in a number of ideals found within its narrative and visuals into its aural landscape. The Wicker Man follows the journey of a police Sgt. Howie (Edward Woodward) as he investigates the disappearance of a young girl from a remote pagan community living on an island off Scotland. As the film progresses, Howie becomes aware that the islanders are hiding something from him and his journey towards the truth behind the mystery makes up the majority of the film, leading towards its sacrificial climax. “The score was envisaged early in the production process as a key element in creating the pagan themes and colourations of the film and, to this end, it combined musical elements drawn from British folk traditions with styles and arrangements characteristic of late 1960s and early 1970s folk and progressive rock.” (p.103, 2009). Yet this view is far too over simplified and seems too recontextualised to take it at such an obtuse face value. Musically, it has few peers from its era of horror and this music, more so than other examples within this essay, is absolutely vital to the film’s narrative progression, its sense of ritual, and its relationships with the Folk Horror Chain. This music, as a more general contextualisation, seems not unlike many of the albums that came out around the same time; its aura being that of a pre-occupation with an “Olde England” (or Scotland) and the traditions that, though little known in modern society, are still found in pockets of savage ruralism[i]. “Behind the soundtrack was the Italian-American playwright and musician Paul Giovanni, who somehow tapped straight into the British folk tradition, to trance-like, hypnotic effect. Seemingly situated somewhere outside of the period in which it was recorded, or any period, Giovanni’s astonishing music, fused with Hardy’s beautifully composed imagery, is a major factor in The Wicker Man’s enduring appeal.” (p.27, 2013). Yet this reading contradicts a number of this sections main arguments and ignores the influence of the cultural landscape outside of the film. However, this music does present an authentically traditional cultural evolution similarly to the more general evolution of folklore as Bennett argues: “Almost since the inception of the Folklore Society in 1878, folkloristic concepts and methods have been dominated by a single theory of culture – cultural evolution.” (p.25, 1994). The musical developments which the film takes are far more unique to the film than to the practices of the sub-genre as a whole[ii]. In other words, folk aesthetics in the soundtrack does not always delineate a film as folk horror[iii]. It is the styling, instrumentation and use of Giovanni’s music that brings together questions of tradition. The film is famous for a narrative twist that is very difficult to predict yet the musical leanings and its emphasis hint at what tradition actually means for the inhabitants of the island and suggests a lot more than the casual viewer probably perceives. While some of the music plays along with the illusion and the lies of the film, other parts actively encourage the viewer to see what is really happening on the island. This is what this essay will name as the music’s narrative functionality. [i] For example, Steeleye Span’s Parcel of Rogues (1973), Pentangle’s Soloman’s Seal (1972), Led Zeppelin’s 3 (1970) etc. [ii] In other words, folk horror is not so named simply because of its relationship with or use of folk music. [iii] Several horror films do include such happenings though are not included in this essay as they are made outside of the UK, for example John Boorman’s Deliverance (1972) with its folk songs and infamous “duelling Banjos” sequence. Boorman is however an Englishman. The Female Voice in Subversive Soundtracks of the Counter-Culture Era.